The UK proof arrived completing that set. I find it amazing what can be done with paper thicknesses. 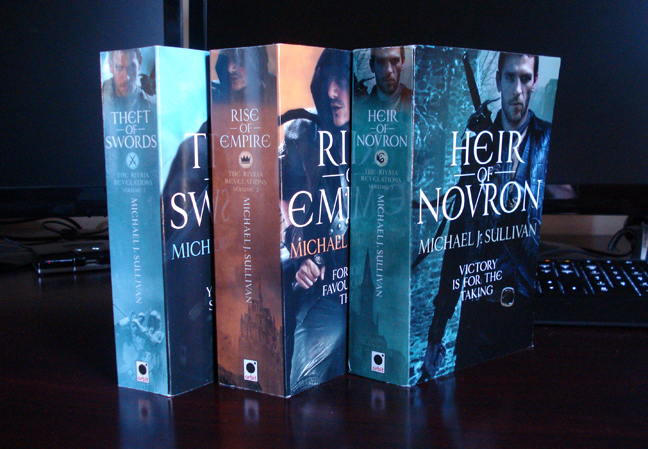 As you can see, Rise of Empire has the thickest spine, and Heir almost looks like the shortest book. It’s not—not by a long shot. The UK edition for Heir clocks in at 928 pages, not including the extras, where Rise is only 781. And Theft is a mere 664. But you’d never tell that by looking at them. In the American editions, the difference is even more profound as those of you who have them can attest. Theft is considerably thicker than Rise, but the weight! Theft seems to float compared the Rise which has the feel of a college text book. I suppose the thought here is to try and keep the thicknesses similar aiming for consistency. But for anyone looking at Heir and thinking, “Hey, this is going to be a quicker read than the other two,” it may be, but not because of its length. Congratulations (again). I can't imagine how exciting it is for you to see your work sitting in front of you like that. When can we expect a box set for the trilogy? When it hits the New York Times list. Personally, I'd like a nice raised-edge, gold leaf, single-volume, leather-bound version with gilded edges, fancy end pages and one of those satin ribbons to mark your place. It would be huge though, not the kind of thing to put in a backpack.